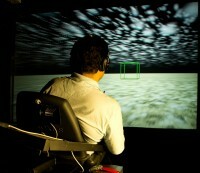 Can self-motion per­cep­tion in vir­tual real­ity (VR) be enhanced by pro­vid­ing afford­able, user-powered min­i­mal motion cueing? Introduction & Motivation: Can self-motion per­cep­tion in vir­tual real­ity (VR) be enhanced by pro­vid­ing afford­able, user-powered min­i­mal motion cueing? To inves­ti­gate this, we com­pared the effect of dif­fer­ent inter­ac­tion and motion par­a­digms on onset latency and inten­sity of self-motion illu­sions (“vec­tion”) induced by curvi­lin­ear loco­mo­tion in pro­jec­tion– based VR. Methods: Participants either pas­sively observed the sim­u­la­tion or had to actively follow pre-defined tra­jec­to­ries of dif­fer­ent cur­va­ture in a simple vir­tual scene. 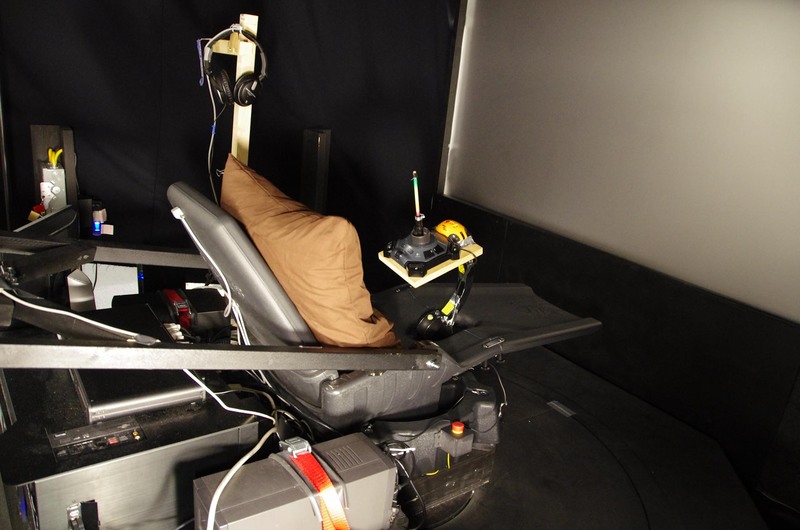 Visual-only loco­mo­tion (either pas­sive or with joy­stick con­trol) was com­pared to loco­mo­tion con­trolled by a mod­i­fied Gyroxus gaming chair, where lean­ing for­wards and side­ways (±10cm) con­trolled sim­u­lated trans­la­tions and rota­tions, respec­tively, using a veloc­ity con­trol par­a­digm sim­i­lar to a joy­stick. In the active visual+chair motion con­di­tion, par­tic­i­pants con­trolled the chair motion and result­ing vir­tual loco­mo­tion them­selves, with– out the need for exter­nal actu­a­tion. In the pas­sive visual+chair motion con­di­tion, the exper­i­menter did this. Results & Discussion: Self-motion inten­sity was increased in the visual+chair motion con­di­tions as com­pared visual-only motion, cor­rob­o­rat­ing the ben­e­fit of simple motion cueing. Surprisingly, how­ever, active con­trol reduced the occur­rence of vec­tion and increased vec­tion onset laten­cies, espe­cially in the chair motion con­di­tion. This might be related to the reduced intu­itive­ness and con­trol­la­bil­ity observed for the active chair motion as com­pared to the joy­stick condition. Conclusions: Together, find­ings sug­gest that simple user-initiated motion cueing can in prin­ci­ple pro­vide an afford­able means of increas­ing self-motion sim­u­la­tion fidelity in VR. However, usabil­ity and con­trol­la­bil­ity issues of the gaming chair used might have coun­ter­acted the ben­e­fit of such motion cueing, and sug­gests ways to improve the inter­ac­tion paradigm. Below is an exam­ple of how one can con­trol the self-motion sim­u­lated in Virtual Reality by simply lean­ing into the direc­tion of intended travel. No motors, actu­a­tors, or com­plex motion cueing algo­rithms needed.